This mildly flavored rice dish is known as Mushroom Pulao/Pilaf/Pulav. Mushroom Pulao or Pilaf is an easy one-pot rice dish made with button mushroom and mildly seasoned with various spices. This simple rice dish can surely elevate any meal. The caramelized onions, sweetness from the aromatic spices and sautéed mushrooms make this plate of rice dish taste a little extra special. 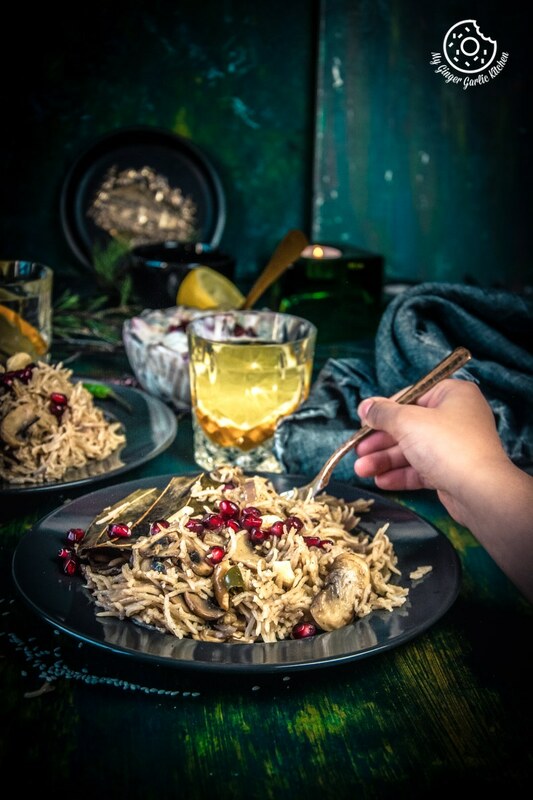 This One Pot Mushroom Pulao is a very tasty and flavorful dish and can be made in just a few minutes of effective labor. 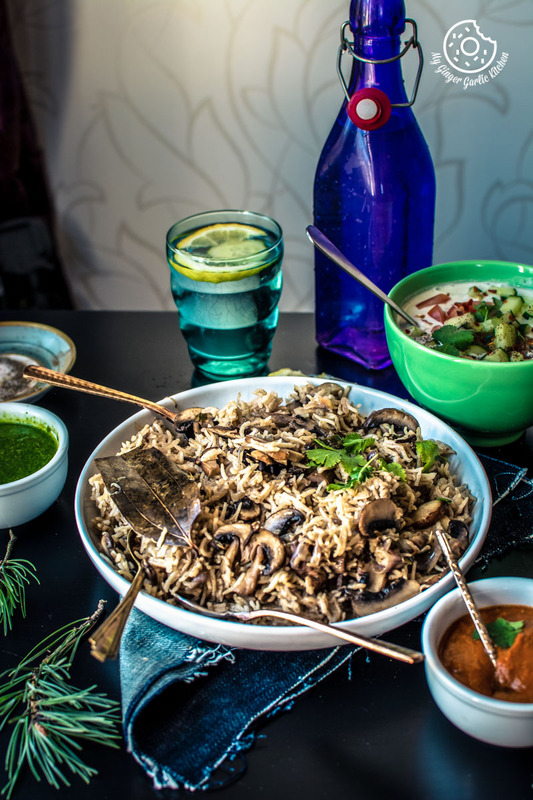 This mushroom pulao is a quick and easy one pot dish which only takes 20 minutes from start to finish. This is a perfect weeknight dinner meal option when you don’t have much time to get dinner on the table and want some quick and nutritious meal with some carbs. 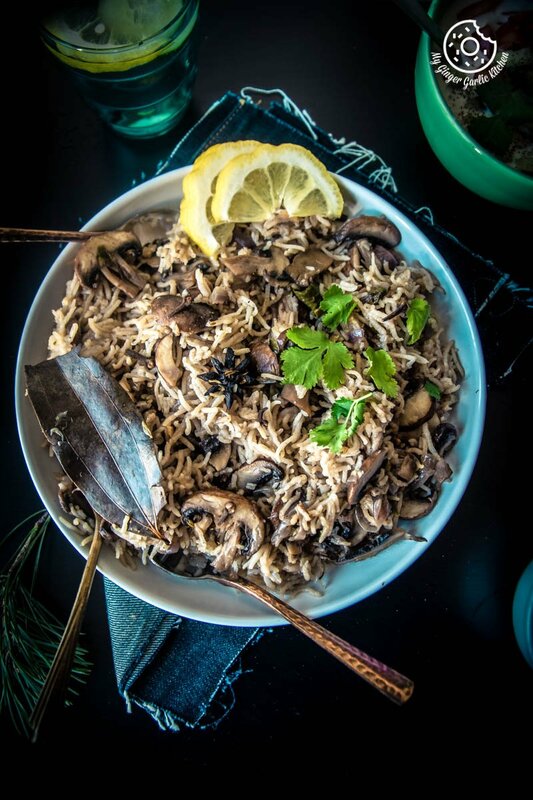 How to make mushroom pulao recipe? Rinse the rice under running cold water till water runs clear. Add enough water to the bowl and soak it for 25-30 minutes. After 30 minutes, drain the water from the soaked rice. Now add crushed ginger and garlic to this. You sauté them for a few minutes and then you add sliced mushrooms and cook them together for 5 minutes. Then you add some green chilies for some hot flavors. Add soaked rice, some spices, salt, and lemon juice. 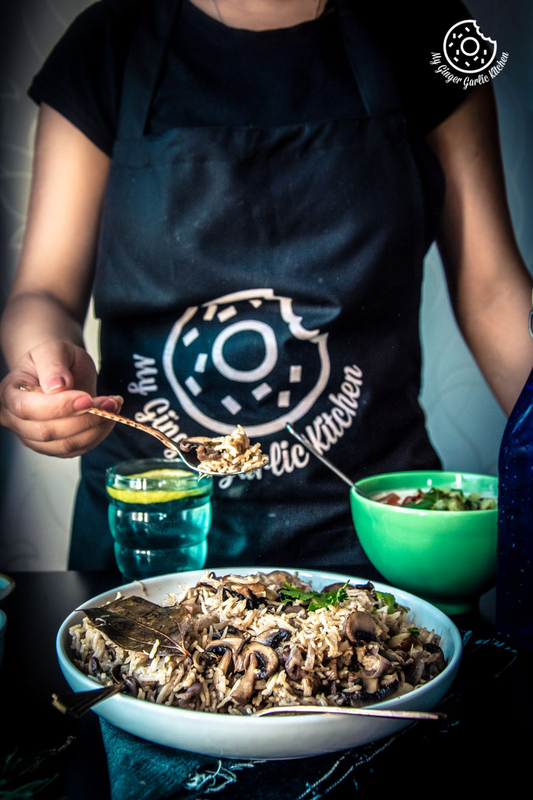 Pressure cook for 2 whistles and your delicious Mushroom pulao is ready to be served. 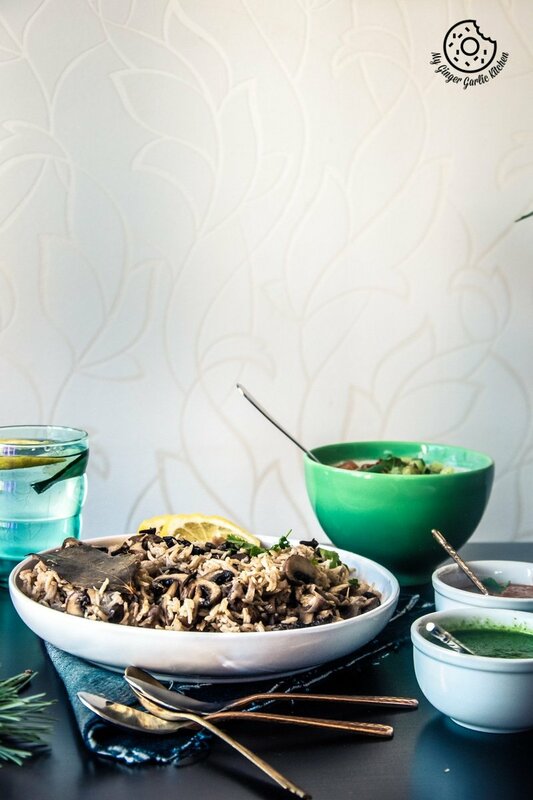 How to make Mushroom Pulao in an Instant Pot? 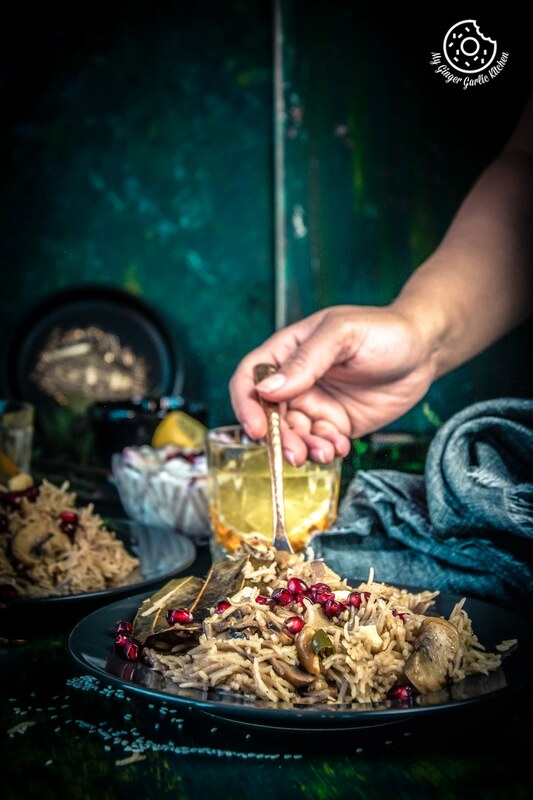 I have made this pulao in the pressure cooker but this can be made in an Instant Pot. 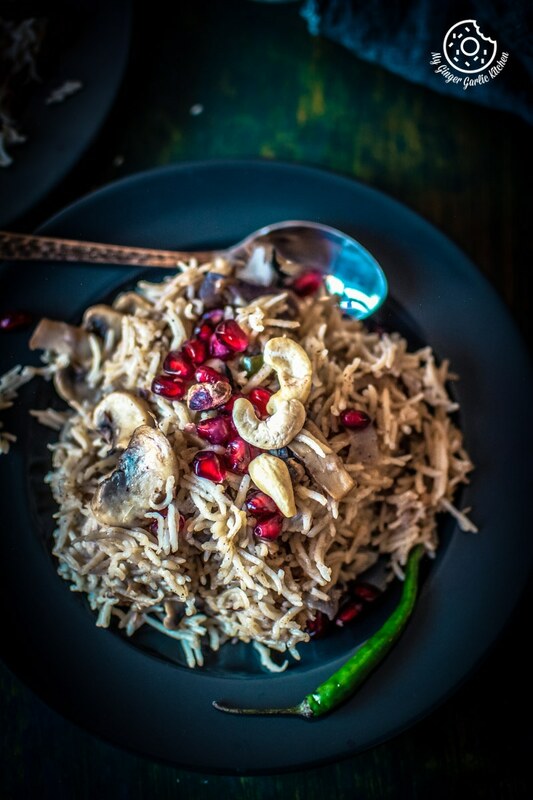 I have given Instant Pot Mushroom Pulao recipe in the recipe box on this page. Use a damp cloth/paper towel or a soft mushroom brush to wipe each mushroom, clean the black spots and to remove any dirt. Clean one mushroom at a time. After cleaning the mushrooms, lightly rinse them for a few seconds with cold water. You can either rinse them under running water or in a bowl. Drain the water and pat them dry with a clean towel. Mushrooms are ready for use. Never soak the mushrooms in the water, because they soak up the water and mushrooms won’t turn nicely brown when cooked if they are full of water. How to serve Mushroom Pulao? 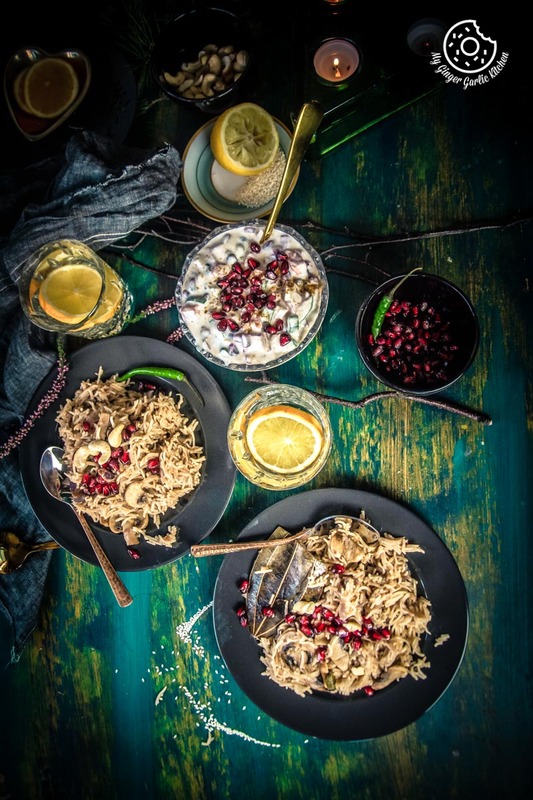 This mild and flavorful pulao is a complete meal in itself which is best served with some chilled raita, chutneys, a spoonful of Indian pickle and some papad. That’s how I like to eat it. But you can also have this with some dal. You can also have it with some plain yogurt. Can I pack Mushroom Pulao in the lunch box? Yes, definitely. Like any other rice dish, this pulao makes a great lunch and it stays fresh for a long time. The water which you used to soak the rice is very nutritious, so instead of fresh water, you can use the same water for cooking pulao. 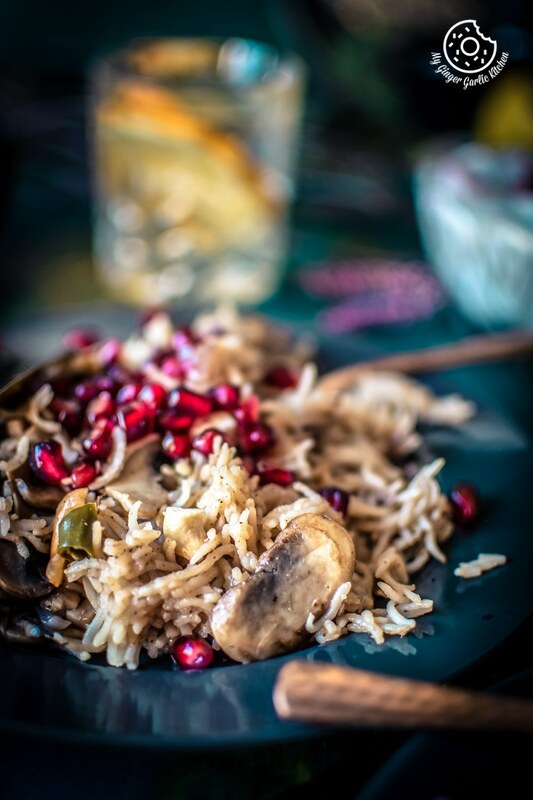 This way your mushroom pulao would come out more flavorsome and delicious. I have used olive oil for making this pulao, but you can replace it with the same amount of ghee or butter. This would make it taste richer and more aromatic. If not serving the pulao right after cooking, then keep the pressure cooker covered with the lid. This way it would stay warm for a longer time. 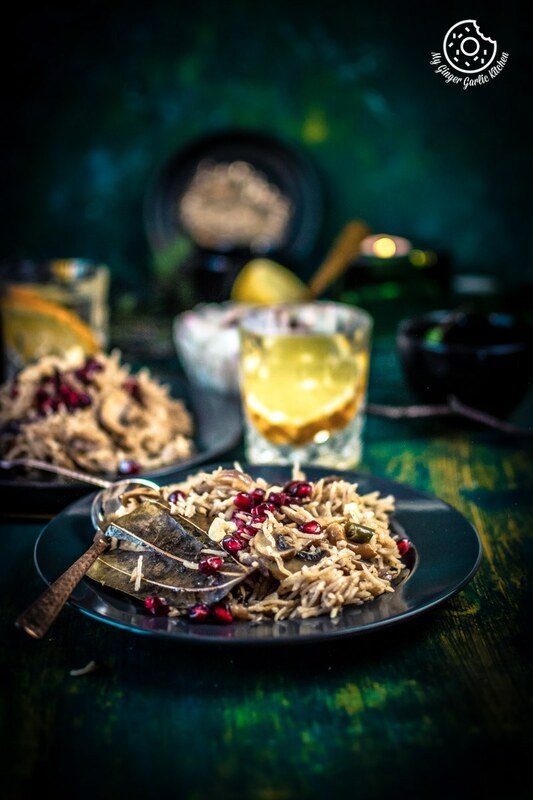 I am sharing mushroom pulao recipe today, but if you are looking for Mushroom Matar Pulao Recipe, then you can simply make it by adding some green peas with mushrooms to this recipe. The rest of the recipe would be the same. Addition of peas would definitely add more color and taste. You can also make Mushroom Peas Corn Pulao by adding corn kernels and green peas. You can keep the rest of the recipe same, or you can also go through this recipe of Mushroom Peas Corn Pulav which I have already shared on the blog earlier. Gather all whole spices in a single plate beforehand. This would make the cooking experience easy. Addition of cashew is optional. You can completely omit it or replace it with some almonds and/or raisins. Do not over pressure cook rice, because overcooking would make your pulao mushy. Pulao tastes good when each grain of rice is perfectly cooked and separated. I cooked my pulao in a pressure cooker, but you can replicate the same recipe using any other pot, or a rice cooker. For making it in a rice cooker, you’ll have to sauté vegetables separately before cooking them with the rice and spices. 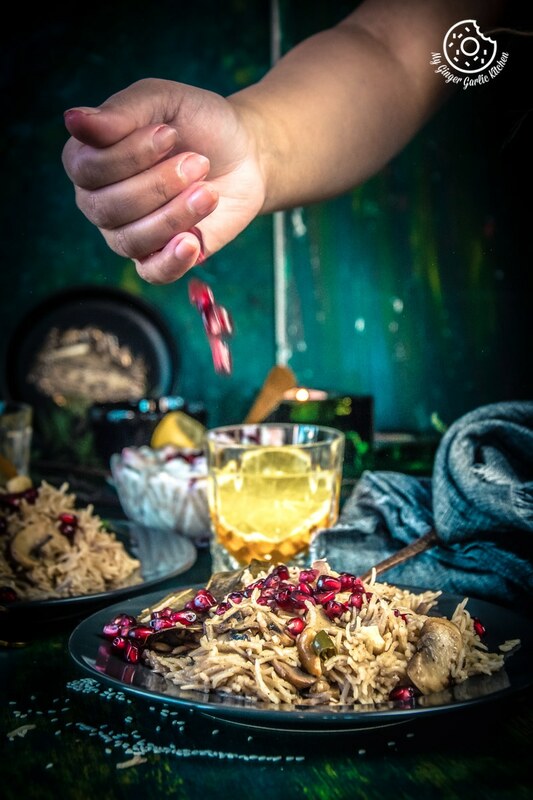 I have used Basmati rice for this pulao recipe but you can use brown rice, wild rice, or any of your favorite rice for making this pulao. This mildly flavored rice dish is known as Mushroom Pulao/Pilaf/Pulav. Mushroom Pulao or Pilaf is an easy one-pot rice dish made with button mushroom and mildly seasoned with various spices. This simple rice dish can surely elevate any meal. The caramelized onions, sweetness from the aromatic spices and sautéed mushrooms make this plate of rice dish taste a little extra special. 1. Rinse the rice under running cold water till water runs clear. 2. Add enough water to the bowl and soak it for 25-30 minutes. 1. Heat 2.5 tbsp oil in a pressure cooker over medium heat. 2. Once hot add the whole spices (bay leaf, cinnamon stick, star anise, cloves, and green cardamom), cashew nuts, and sauté for 40-45 seconds. 4. Now add the chopped onions and sauté them for 5-7 minutes or till the onions get translucent or they turn light pink in color. 5. Add the sliced mushroom and stir well. Sauté for 5 minutes. 6. Now add green chilies and mix well. Cook for another minute. 7. Now add the soaked rice, mix and cook for a minute. 8. Add salt, coriander powder, garam masala powder, black pepper powder, and lemon juice. Mix everything well. 9. Add 3.5 cups of water and give it a mix. 10. Add coriander leaves and mix well again. 11. Let it come to a boil. 12. Cover the pressure cooker with lid, put the weight on. 13. Cook on high heat for 2 whistles. Then turn off the heat. 14. Let the pressure go down completely before opening the lid. 15. Gently fluff up the rice using a spatula or a fork. 16. Serve hot with some raita, pickle, and chutney. 1. Place the inner pot inside the instant pot. 2. Start the instant pot in sauté mode and heat it. 3. Once the screen displays hot, add 2.5 tbsp oil to it. 4. Once hot add the whole spices (bay leaf, cinnamon stick, star anise, cloves, and green cardamom), cashew nuts to the pot and sauté for 40-45 seconds. 5. Add cumin seeds and let them sizzle. 7. Add the sliced mushroom and stir well. Sauté for 5 minutes. 8. Now add green chilies and mix well. Cook for another minute. 9. Now add the soaked rice, mix and cook for a minute. 10. Add salt, coriander powder, garam masala powder, black pepper powder, and lemon juice. Mix everything well. 11. Add 3.5 cups of water and give it a mix. 12. Add coriander leaves and mix well again. 13. Let it come to a boil. 14. Switch off the saute mode. 15. Change the instant pot setting to manual or pressure cook mode for 4 minutes at high pressure. 16. Close the instant pot lid with vent in sealing position. 17. When the instant pot beeps, do NPR (natural pressure release) for 5 minutes and then do QPR (quick pressure release). 18. Once you open the lid, let the pulao rest for 5­-7 minutes. 19. Take a fork or a spatula and Fluff the rice gently. 20. Serve hot with some raita, curry, and chutney.